A delicious, healthy cold salad with brown rice and garbanzos. Mix all ingredients together and toss well. 460 members have added this recipe to their cookbook. Super good and super easy. Yum! Fits in well with Phase 1 of Fat Smash. Thanks! Steamed barley, brown rice and quinoa. 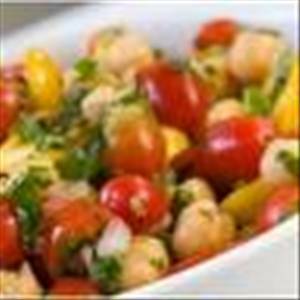 There are 115 calories in 1 serving of Garbanzo and Rice Salad. Calorie break-down: 8% fat, 79% carbs, 13% protein.